You may remember before about a week or two ago when I was picking yarn for the Mystery Knit along that I went through my entire stash and I couldn’t find the yarn that I was looking for? Well on Sunday I was cleaning up again and going through projects that I have on the needles. I was opening project bags and other bits and bobs seeing what was in there and trying to consolidate things down. Well I found a pair of socks that I was knitting for a test knit that had one of the skeins in question, it’s not a test knit anymore. They’re the Whiskey and Rye socks which I was knitting out of Miss Babs Yummy 2-ply in Zombie Prom color way. Quite a nice pair of socks and I remember stopping working on the second sock because I might run out of yarn. But I think I have enough to get through the rest of the sock, even with my big feet. I remembered I was working on another pattern with the yarn in question, Conflagration out of Miss Bobs Yummy 2-ply in Bat S**t Crazy. Theres skein number two of three, but I couldn’t find the remaining one that I was missing. I dutifully put away yarn, reorganized bins, and touched a lot of my yarn. I was still perplexed to what happened to that yarn. Maybe I used it in something and just didn’t remember working with it. Maybe i gave it away to someone or sold it. Or perhaps it was eaten by the stash as some kind of tribute to keep itself alive. I don’t put it past the stash anymore, I sometimes hear it say “feed me Seymore,” which if you know the reference then you know what I’m talking about. The stash has said and done weirder things, I think. I kept working along, cleaning through everything, happily touching yarn and realizing more and more how much I have. Then I looked at my loom, which I haven’t worked on in a while and I stared at what was warped on it. I realized the third skein was starting at me straight in the face. 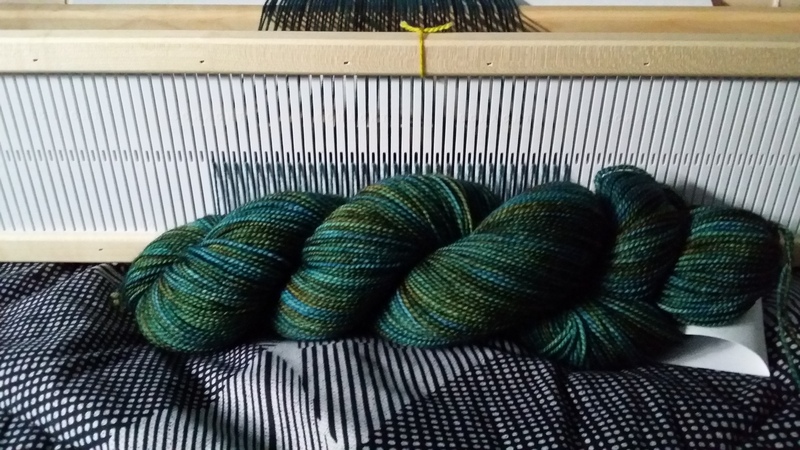 The skein I was looking for was warped on my loom in plain sight. I couldn’t believe I didn’t realize that the yarn I was desperately trying to find was right there. I had started a patterned scarf on the loom and work on it every so often to work through the stash a little. But the last remaining skein that I was looking for and racking my brain was right there. I think I couldn’t hear it trying to tell me it was there over the roaring sound of the stash. Oh and the wool fumes didn’t help either. The colorway of that yarn is Zombie Reunion also in Miss Babs Yummy 2-ply. Well I felt quite ridiculous on Sunday I had to step away from the yarn and cleaning and have a sit. I couldn’t believe I had been so blind to not see the very yarn that I was searching for. I then realized that I needed to get all of these other projects done as well so I don’t have this happen again. So I put all of the projects in progress in one area, even though they were pretty close before. I looked in all of the bags and saw how much or little work each of them needed, making a mental list as I went. S now I’m going to be working as fast as I can on getting all of these done as well. That is as I work on my other two main projects or when one of them is done. I don’t just want to abandon one of the projects I’m currently working on because the cycle would just start again. For now I’m going to knit feverishly and try to make myself feel better. Here’s some knitting pictures to distract you. On the bright side I’m making some good progress on the mystery knitting. I know I’m supposed to make two identical pieces, but I figured I might as well try to get one piece caught up and get the other one caught up in the next week or so. In about 5 days I’m halfway-ish through clue 3, not too bad of timing. Clue 4 will release soon and I’m looking forward to that, but I’ll need to get the second piece ready to go after clue 3 is done. Or maybe clue 4, depends on what that clue entails.